Waverley Council is a partner of the Eastern Region Local Government Aboriginal and Torres Strait Islander Forum (ERLGATSIF), a network of six Councils: Waverley, Bayside, City of Sydney, Randwick, Inner West, and Woollahra. 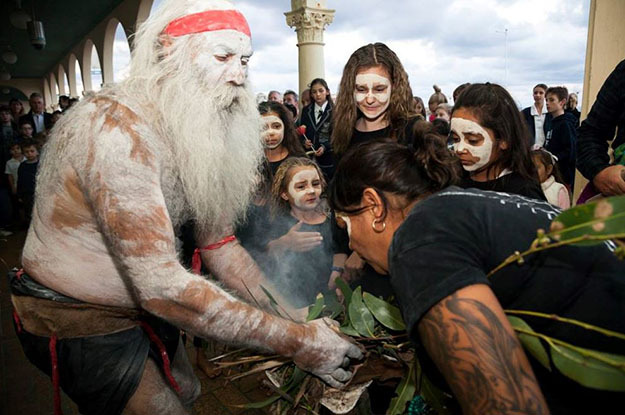 Created in 1998, the forum aims to address and participate at a regional level in the affairs, events and celebrations that impact on our local Aboriginal and Torres Strait Islander communities. To access the online application form for the award and competitions please click here. The forum coordinator, Monica Stevens is currently based at the Inner West Council and Councillor Dominic WY Kanak is the chairperson for this forum. The 2017 Pauline McLeod Awards: Facing Bondi Beach, members of the McLeod family proudly conduct the smoking ceremony on the steps of the pavilion. Thank you to those who joined us for Boondi Boondi at Bondi Beach on April 1, to celebrate Aboriginal and Torres Strait Islander cultures through ceremony and the cooking and sharing of delicious food. To view some fantastic photos from the day please follow the link.